Spending 24 hours in a fluffy bathrobe is my idea of luxury, though clearly not a frequent experience for many. Hence when I check into my room at Galgorm Resort & Spa, in County Antrim, I find instructions on how to spa. 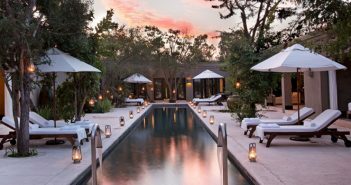 It’s not surprising some pointers may be needed given the multiple facilities on offer at this impressive location that encompasses 75,00 square feet fusing the natural elements of air, fire, earth and water into the design, décor and spa experiences. On the banks of the river Maine near Ballymena (in the heart of Game of Thrones country) this is an idyllic spot where indoor and outdoor features combine to provide guests with a “journey of re-discovery”. 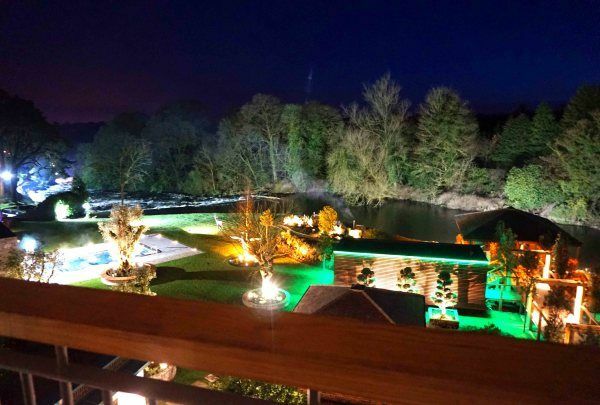 More than £10 million pounds was spent in updating the site which now houses a Thermal Spa Village, two pools and 128 rooms as well as three thriving restaurants (Gillies, Fratelli and River Room). I checked into a lovely room in the new deluxe wing of the hotel after a delicious Afternoon Tea in the hotel’s Conservatory overlooking the grounds and tastefully decorated in soothing greens. Meanwhile my room was in a natural palette of apple greens and greys inspired by the landscape with Aromatherapy Associates products, coffee machine, biscuits and a balcony overlooking the river and outdoor Thermal Village. I couldn’t fault it. My first spa appointment was to try out the innovative Celtic Sauna Ritual, after a short steam session. Originating in Finland, this is Galgorm’s take on the Aufguss ritual. Translated that meant my personal Sauna Master talked me through the ‘Cleansing of the Mind’ ritual whereby towels are agitated in the air so as to lessen the intensity of heat and also allowing me to inhale the three essential oils used in sequence during the process. All the while the Sauna overlooks the river with floor to ceiling windows. While I found the Sauna Master’s flapping mildly amusing, (and could see this appealing to groups such as Hen parties), this was a good introduction to a follow up guided meditation session in the Orangery. Lying on a mattress at sunset, surrounded by nature and listening to someone else guide you through breathing and mindfulness exercises is deeply relaxing and I can understand how many can float away into sleep quite easily. By the time I was finished, evening was falling – perfect conditions to enjoy the Riverside Tub “Tranquility” experience. This is an hour’s private bathing experience with champagne and chocolates provided to complete the fun. The tubs are wood-fired, eco-friendly and quirky, dotted along the banks of the river. I’d never been in a hot tub before but as a first time experience it will be hard to beat. Galgorm also offers a Snow Cabin, experience showers, yoga cabins, outdoor Jacuzzi, a scented sanarium, hydrotherapy pools, a belthane hot tub (for 12) and much more, so a full day or overnight stay is recommended. As a prelude to dinner in Gillies, the afternoon’s spa-ing insured a good night’s sleep, before recommencing after a hearty breakfast the following morning. There are two breakfast areas for hotel residents – do try the River Room with sweeping views of the river rapids and the poshest Ulster Fry you’ll ever be served. As for the spa products for facial and body treatments – Aromatherapy Associates, Voya and Lava Shells are used for the 25 signature treatments whilst various day packages are also offered. I opted for a Voya facial on the basis of ‘when in Ireland, use local products’. Totally organic and made from hand harvested seaweed, Voya is particularly effective in moisturising skin, improving skin tone and minimising ageing. The Rediscovery Facial started with a warm facial mask packed with vitamins to restore radiance and was followed by the application of seaweed leaves to help with skin regeneration. While these were working their magic, the therapist administered a facial, head and foot massage. All told 85 minutes of pure indulgence with results. Verdict: This is a bustling, busy resort that deserves its listing as one of the Top 10 Spa Resorts in the UK (The Sunday Times). The setting could not be better while the facilities on offer as well as the food and beverage options make it a value for money break away. It’s ideally situated for those visiting Northern Ireland for the first time – only 30 minutes from Belfast City Airport and Galgorm Resort & Spa.